Post Cards From the Past: Good King Wenceslas, Not a Brit? Good King Wenceslas, Not a Brit? Back in ’06 my wife and I visited the Czech Republic. We spent a day or two wandering around the streets of Prague, which is a wonderful place to visit. As we strolled through the never-ending blocks of shops and cafes, we stumbled on Saint Wenceslas Square. I had always thought the “Good King Wenceslas” of song was from Britain. It is a British Christmas Carol, right? 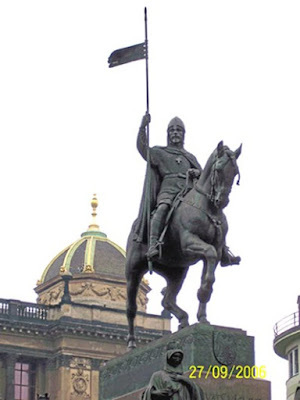 It seems that the good king was actually Saint Wenceslas I, duke of Bohemia. He may not have even been a king. He came to power in about 925 AD. During this period the Holy Roman Empire dominated the European Continent, with Prague situated its eastern edge. Wenceslas had a pagan mother, but his father was Christian and he adopted Christianity. He is known as a great warrior, but all I could find on the internet was that he capitulated to the Holy Roman Empire without fighting and agreed to pay them tribute. Maybe he was just smarter than most warrior leaders. He became most famous for running around barefoot across winter’s snow delivering alms to poor widows, prisoners, and sick people, which is really a strange thing for a warrior king to be doing. One can only guess that he was deeply smitten with doing “good works”. This is the part of the legend that was captured in a Czech poem and put to song by John Mason Neala in England in the early 1800 hundreds. 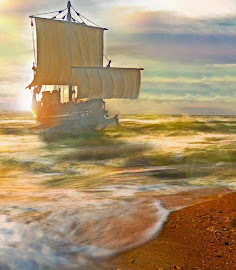 Because of his good deeds and piety, his story spread across Europe quickly. After his death, he became a foremost example of a “Righteous King.” Hence, Wenceslas was known in places as far away as Britain. I propose his Arthur-like traits promoted his popularity, particularly in England and France. His legend even predicts that, like Arthur, he will return with his great sword and defend the land against invaders.